Quietly nestled in Central Siem Reap, this romantic luxury hideaway is an exquisite boutique hotel, part of the world-renowned Relais and Chateaux alliance. 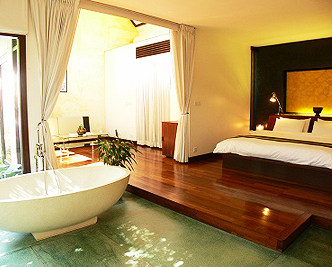 Featuring only 26 rooms and suites, the Heritage is the ideal intimate base for an amazing Angkor experience. Authenticity, tradition and modern influences prevail. The architecture, the beautifully spacious suites, the unequalled kindness and efficiency of the staff and the culinary Western and Cambodian delights make heritage unique. A luxurious sanctuary; still just a 3-minute Tuk-Tuk ride from downtown Siem Reap and a 10-minute ride from Angkor Wat temples and their wonders. Touring Indochina, longing for that genuine weekend getaway or hungry for that discovery and adventure trips off the beaten tracks, Heritage Suites Hotel is the choice. Limited to 5 rooms only so please book as fast as you can! *Rooms are limited and may be sold out immediately without being able to update this promotion page. Heritage Suite Hotel in larger map.